Tilley entered the United States Naval Academy during the height of the Civil War, graduating after the conflict. He gradually rose through the ranks and participated as a lieutenant in the United States military crackdown against strikers in the wake of the Great Railroad Strike of 1877. He and a small contingent of sailors and marines defended the American consulate in Santiago, Chile during the 1891 Chilean Civil War. He was a commander during the Spanish–American War, and his gunship USS Newport successfully captured two Spanish Navy ships. After the war, he was made the first acting-Governor of Tutuila and Manua (later called American Samoa) and set legal and administrative precedents for the new territory. After 41 years of service, he was promoted to rear admiral but died of pneumonia shortly afterwards. In 1890, Tilley was transferred to San Francisco to help test the newly built USS San Francisco and to become her executive officer. San Francisco transported troops to the port of Valparaíso during the 1891 Chilean Civil War, from which they could move on to protect the American consulate in the capital of Santiago. Insurgents captured the city, and Tilley remained to defend the consulate with a force of 100 men. After the war, he returned to the naval academy as head of the astronomy and navigation department. In 1896, he took command of USS Bancroft and sailed on an inspection tour of naval yards along the east coast of the United States. He was promoted to commander that October. In 1897, he was given command of USS Newport to sail to Nicaragua to evaluate the progress of the isthmus canal commission. Even before Tilley arrived in Samoa, the political situation there was shifting. The Second Samoan Civil War had recently ended, leaving the islands without a functioning central government. The United States, the United Kingdom, and Germany had competing strategic and economic interests in the region. Ratification of the Tripartite Convention on February 16, 1900 partitioned the Samoan archipelago. The eastern part, with Tutuila as its largest island, was placed under the control of the United States. The larger and historically dominant western part was assigned to Germany. Under this treaty, the British government relinquished its claims over Samoa in exchange for certain concessions from Germany in the Pacific and Africa. 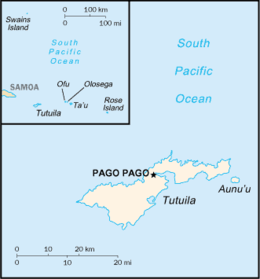 Map of American Samoa. Swains Island was not added to the territory until 1925. ^ Sorensen, Stan (2008-06-13). "Historical Notes". Tapuitea. III (24). p. 2. ^ a b "Tilley". Government of American Samoa. 2007. Archived from the original on 2008-05-17. Retrieved 2008-05-18. ^ a b c Hamersly, Lewis Randolph (1898). The Records of Living Officers of the U.S. Navy and Marine Corps (PDF) (6th ed.). New York: L. R. Hamersly and co. p. 106. Retrieved 2007-04-13. ^ "Miscellaneous". The New York Times. 1866-07-21. p. 6. ^ C., H. C. (January 1879). "The Naval Brigade and the Marine Battalions in the Labor Strikes of 1877". United Service. 1 (1): 115–130. ^ "Society Weddings". Washington Post. 1878-06-06. p. 4. ^ "Naval Academy Affairs". The Sun. 1885-09-29. p. Supplement 1. ; "The Army and Navy". Washington Post. 1889-09-22. p. 12. ; "The Army and Navy News". The New York Times. 1889-12-29. p. 16. ^ "Santiago Capitulates". Chicago Daily Tribune. 1891-08-30. p. 1. ^ "The United Service". The New York Times. 1896-10-21. p. 3. ^ "The Panama's Valuation". Los Angeles Times. 1898-04-27. p. 3. (Subscription required (help)). Cite uses deprecated parameter |subscription= ( help) Alternate Link via ProQuest. ^ Dyal, Donald H. (1996). Historical Dictionary of the Spanish–American War. Greenwood Publishing Group. pp. 238–239. ISBN 0-313-28852-6. ^ "Naval Orders". Washington Post. 1898-10-25. p. 4. (Subscription required (help)). Cite uses deprecated parameter |subscription= ( help) Alternate Link via ProQuest. ^ "The United Service". The New York Times. 1898-10-21. p. 4. ^ Gray, J. A. C. (1960). Amerika Samoa: History of American Samoa and Its United States Naval Administration. Annapolis, Maryland: United States Naval Institute. p. 58. ^ Gray, J. A. C. (1960). Amerika Samoa: History of American Samoa and Its United States Naval Administration. Annapolis, Maryland: United States Naval Institute. pp. 64–66. ^ a b c Gray, J. A. C. (1960). Amerika Samoa: History of American Samoa and Its United States Naval Administration. Annapolis, Maryland: United States Naval Institute. pp. 105–108. ^ Gray, J. A. C. (1960). Amerika Samoa: History of American Samoa and Its United States Naval Administration. Annapolis, Maryland: United States Naval Institute. pp. 157–158. ^ Gray, J. A. C. (1960). Amerika Samoa: History of American Samoa and Its United States Naval Administration. Annapolis, Maryland: United States Naval Institute. pp. 125–128. ^ Gray, J. A. C. (1960). Amerika Samoa: History of American Samoa and Its United States Naval Administration. Annapolis, Maryland: United States Naval Institute. pp. 132–134. ^ Gray, J. A. C. (1960). Amerika Samoa: History of American Samoa and Its United States Naval Administration. Annapolis, Maryland: United States Naval Institute. p. 127. ^ a b Gray, J. A. C. (1960). Amerika Samoa: History of American Samoa and Its United States Naval Administration. Annapolis, Maryland: United States Naval Institute. pp. 137–139. ^ a b Sebree, Uriel (1902-11-27). "Progress in American Samoa". The Independent. 54 (2817): 2811–2822. ^ Gray, J. A. C. (1960). Amerika Samoa: History of American Samoa and Its United States Naval Administration. Annapolis, Maryland: United States Naval Institute. pp. 150–151. ^ "Assignment for Funston". Washington Post. 1902-03-18. p. 9. (Subscription required (help)). Cite uses deprecated parameter |subscription= ( help) Alternate Link via ProQuest. ^ "The United Service". The New York Times. 1905-01-15. p. 5. ^ "Death of Admiral Tilley". Washington Post. 1907-03-19. p. 3. (Subscription required (help)). Cite uses deprecated parameter |subscription= ( help) Alternate Link via ProQuest. ^ "The Silent Reaper's Harvest of the Great". Washington Post. 1907-12-29. p. MS8. (Subscription required (help)). Cite uses deprecated parameter |subscription= ( help) Alternate Link via ProQuest. ^ "Mrs. Emily Tilley Dies at Annapolis". Washington Post. 1931-04-22. p. 20. (Subscription required (help)). Cite uses deprecated parameter |subscription= ( help) Alternate Link via ProQuest. Gray, J. A. C. (1960). Amerika Samoa: History of American Samoa and Its United States Naval Administration. Annapolis, Maryland: United States Naval Institute. OCLC 498821.